GDP data from the UK, the US and Canada; US Consumer Confidence, Unemployment Claims and Manufacturing PMI; Rate decision in the US, Japan and New Zealand. These are the major events lined up for this week. Join us as we explore the market movers for this week. Last week, US data ran below expectations, with a 1,000 rise in the number of jobless claims, reaching 295,000, while analysts expected claims to fall to 288,000. 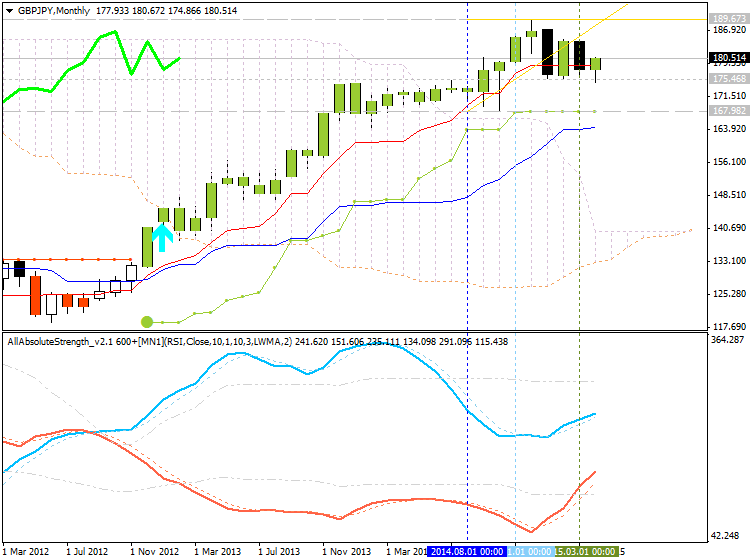 The four- week moving average climbed to 284,500. However, despite the rise in jobless claims, they stayed below 300,000 for the seventh consecutive week. Another disappointing release came from the housing market where new U.S. single-family home sales recorded their sharpest fall in more than 1.5 years, down 11.4% to 481,000 units in March. Analysts expected sales to reach 513,000. Was this a temporary setback for the US? UK GDP: Tuesday, 9:30. Britain’s recovery lost momentum in the fourth quarter of 2014, expanding 0.5% while posting 0.7% growth in the third quarter. Economists expected the economy would expand 0.6%. The main drop occurred in the construction sector. UK’s service sector gained 0.8% in the last quarter. However, despite the slowdown, 2014 growth was the strongest growth since before the financial crisis with an annual expansion of 2.6%. Economists expect the first quarter growth will reach 0.5%. US CB Consumer Confidence: Tuesday, 15:00. U.S. consumer confidence edged up in March to 101.3 from 98.8 in February amid renewed optimism over the labor market. The harsh winter weather and softer global demand, weakened growth early in the first quarter. But consumers continue to be optimistic regarding the labor market. Some analysts believe the soft growth may cause the Fed to delay the planned rate hike. However, positive housing data together with healthy employment reports indicate the US economy is on a growth trend. Consumer sentiment is expected to growth further to 102.6 in April. US GDP: Wednesday, 13:30. The US economy slowed more than expected in the fourth quarter of 2014 as government spending declined sharply and business investment halted. Gross domestic product reached an annual rate of 2.6% from a strong 5% rise in the third quarter. Economists expected 3% growth. The economy grew 2.4% in 2014 compared to 2.2% in 2013. Analysts forecast a boost in growth amid the collapse in energy prices increasing consumer spending power. Analysts forecast a 1.1% expansion in the first quarter. US rate decision: Thursday, 19:00. The Federal Reserve inched closer to hiking rates in its March meeting, but downgraded its economic growth and forecasts, indicating they’re in no hurry to normalize rate levels. The word “patient” was removed from the central bank’s statement, increasing prospects for a rate hike but at the same time not providing a specific date. Yellen told reporters that a June move could not be ruled out. Analysts do not expect the fed to raise rates this time. NZ rate decision: Wednesday, 22:00. The Reserve Bank of New Zealand left the official cash rate on hold, noting it will not cut rates as did the rest 18 central banks around the world and promised a “period of stability” for up to two years. Reserve Bank governor Graeme Wheeler still voiced his concern about the strength of the dollar and the immediate need to depreciate its value. The Bank projects inflation will remain low for the rest of the year. Rates are expected to remain unchanged. Japan rate decision: Thursday. The Bank of Japan has kept its monetary policy unchanged in its April meeting, even though the two year deadline for its 2.0% inflation target has passed and inflation remained near zero. BoJ governor Haruhiko Kuroda stated inflation expectations are positive despite the temporary fall due to the oil price crush and that the Central bank is on the right track and easing measures will continue as planned. Economists do not expect any policy changes this time. Canadian GDP: Thursday, 13:30. Canada’s economy shrank 0.1% in January, following 0.3% gain in December. Economists expected a 0.2% expansion in January. Oil and gas production increased 2.6% as well as oil extraction despite low prices. However, economists believe low oil prices will have a negative effect on inflation and growth, which may compel the central bank to cut another 25 basis points in the near future. Canadian economy is expected to contract 0.2% in February. US Unemployment Claims: Thursday, 13:30. The number of Americans filing initial claims for unemployment benefits increased by 1,000 last week to 295,000. Despite expectations for a lower figure of 288,000, the number of firing is near a 15-year low, indicating the recent decline in hiring is only temporary. The four-week average dropped 22,000 to 2.31 million; the lowest level since December 2000. The number of claims is expected to reach 297,000 this week. US ISM Manufacturing PMI: Friday, 15:00. US Manufacturing PMI fell in March for the first time in 14 months to 51.5 from 52.9 in February. The reading was below market forecast of 52.5. The employment index declined 1.4 points to 50. Exports contracted more strongly to 47.5 from 48.5. Production expanded, but new orders growth slowed to a reading of 51.8. Manufacturing PMI is expected to rise to 52.1 in April. The stage is set and the curtain is rising. The Dollar has wobbled these past weeks, but it hasn’t managed to turn its nine-month long bull trend. The Japanese Yen is likely to look beyond the BOJ policy announcement to focus on Greek funding matters and the outcome of the FOMC rate decision. An important jump in interest rate expectations helped push the British Pound to fresh two-month highs versus the US Dollar. 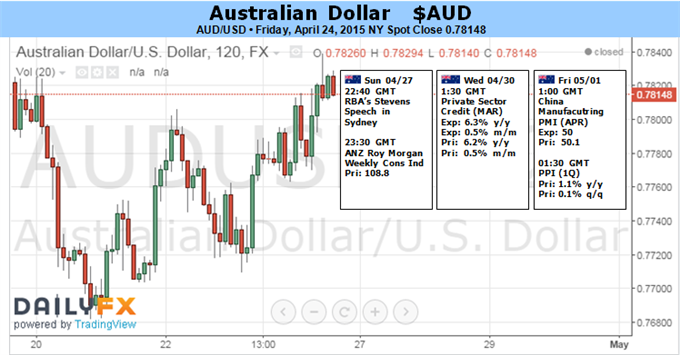 AUD/USD is likely to face increased volatility in the week ahead amid the key developments coming out of the U.S. economy. Gold prices fell for a third consecutive week with the precious metal off more than 2.17% to trade at 1177 ahead of the New York close on Friday. The dollar ended the week lower against the other major currencies on Friday, the second consecutive weekly decline as fresh economic data underlined concerns that the recovery is losing momentum. The Commerce Department reported Friday that orders for durable goods, excluding aircraft, fell 0.5% in March, after a downwardly revised 2.2% drop in February. The headline figure rose 4.0%, beating expectations for a 0.6% gain, but investors focused on underlying weakness in the report. The data came after recent weak reports on home sales, retail sales and industrial production, adding to signs of a slowdown in economic growth since the start of the year. The weak data added to pressure on the dollar which has been hit as investors pushed back expectations on the timing of an initial rate hike by the Federal Reserve. The U.S. dollar index, which measures the greenback’s strength against a trade-weighted basket of six major currencies, was last down to 97.07 late Friday. The index ended the week down 0.62%. EUR/USD was up 0.48% to 1.0874 in late trade, to end the week with gains of 0.61%. 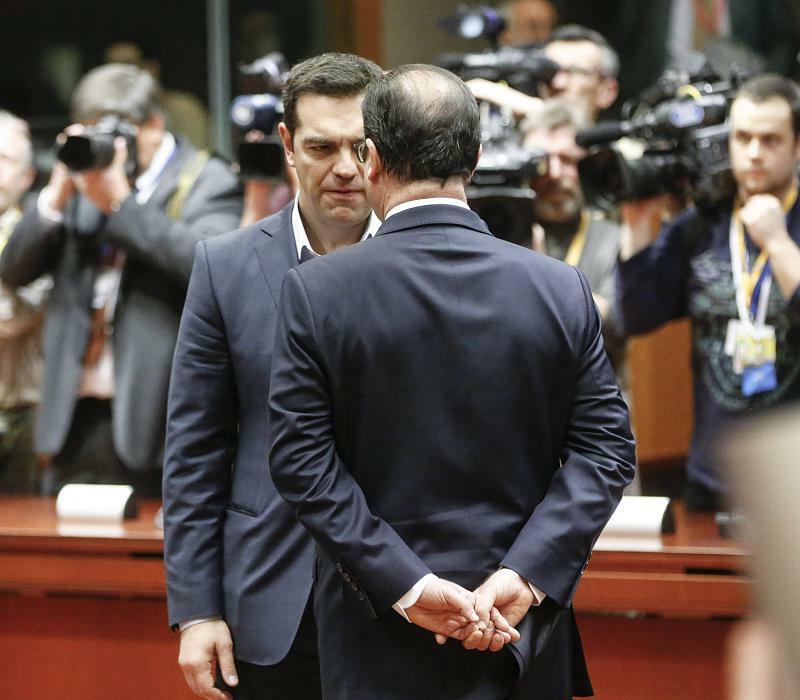 The single currency was held in check as concerns over Greece’s debt negotiations continued. Euro area finance ministers said Friday that Greece must present a full economic reform plan by early May in order to access any further funding. 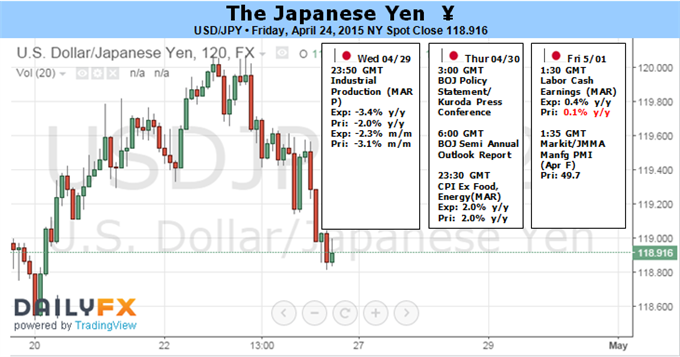 The dollar was also lower against the yen, with USD/JPY down 0.51% to one-week lows of 118.98. 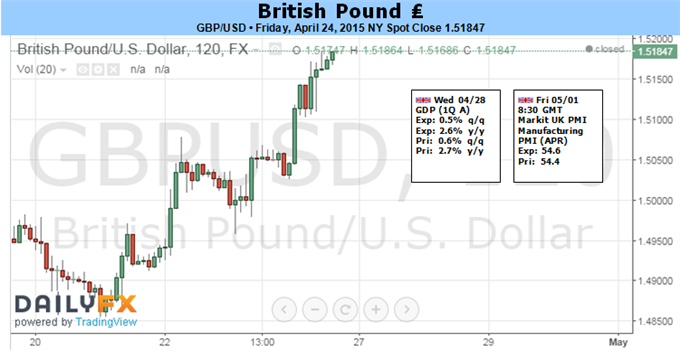 Sterling also pushed higher against the weaker dollar, with GBP/USD adding 0.88% to trade at 1.5188 late Friday. The pound shrugged off uncertainty over the outcome next month’s U.K. general elections. In the week ahead investors will be looking to Wednesday’s Fed statement for clues on the possible timing of a rate increase. Investors will also be focusing on Wednesday’s preliminary reading on U.S. first quarter growth as well as reports on inflation, consumer confidence and manufacturing. Central bank meetings in Japan and New Zealand will also be in focus, as will Thursday's preliminary data on euro zone inflation. Markets in New Zealand will remain closed for a holiday. The U.K. is to release private sector data on industrial order expectations. Reserve Bank of Australia Governor Glenn Stevens is to speak at an event in Sydney. Japan is to release data on retail sales. The U.K. is to publish preliminary data on first quarter economic growth. Later Tuesday, the U.S. is to release private sector data on consumer confidence. New Zealand is to produce reports on the trade balance and business confidence. Markets in Japan are to remain closed for a holiday. In the euro area, German y is to release preliminary data on consumer inflation. The U.K. is to release a private sector report on retail sales. The U.S. is to publish preliminary data on first quarter economic growth in addition to a report on pending home sales. Later in the day the Federal Reserve is to announce its monetary policy decision and publish its rate statement. The Reserve Bank of New Zealand is to announce its benchmark interest rate and publish its rate statement. New Zealand is also to release data on building consents. Japan is to release preliminary data on industrial production. The Bank of Japan is to announce its monetary policy decision and release its rate statement. The announcement is to be followed by a press conference. Germany is to report on retail sales and unemployment, while Spain is to release data on inflation and economic growth. The euro zone is also to release preliminary data on consumer prices and the unemployment rate. Later in the data Canada is to publish its monthly report on economic growth. The U.S. is to publish data on initial jobless claims. Japan is to release a string of reports on inflation, household spending, average earnings and unemployment. Markets in China are to remain closed for a holiday. Beijing is still to release data on manufacturing and service sector activity. In Europe markets in France, Italy, Germany and Switzerland are to remain shut for holidays. Meanwhile, the U.K. is to release data on manufacturing activity. The U.S. is to round up the week with a report for the Institute of Supply Management on Manufacturing activity and revised data on consumer sentiment. 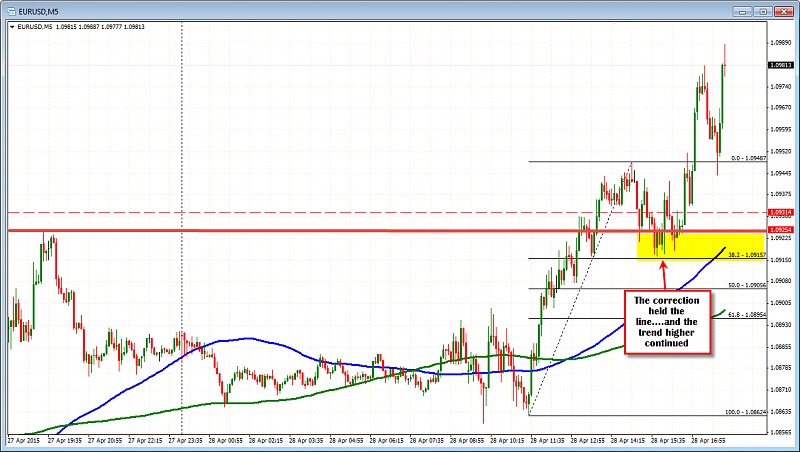 EUR/USD had a choppy week, feeling some pressure but not falling too far. Inflation data stands out just before the May 1st holiday. 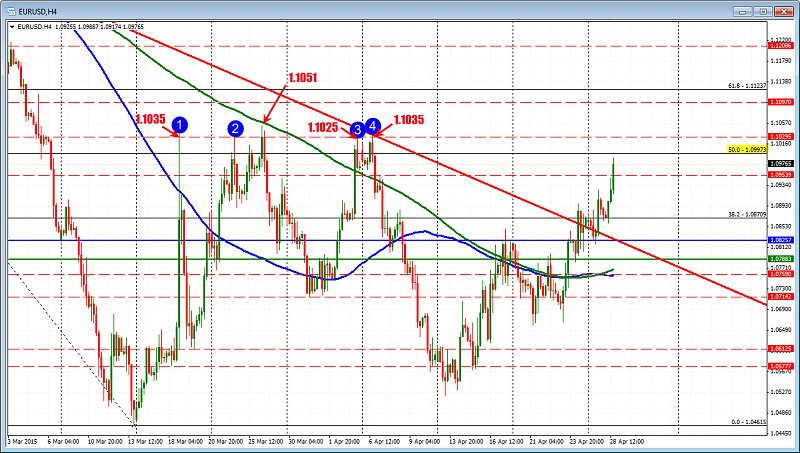 Here is an outlook for the highlights of this week and an updated technical analysis for EUR/USD. Greek headlines drifted between deteriorating conditions and Grexit talk to optimism or at least a deadline delay. This had a growing impact on the common currency. For a change, most euro-zone figures fell short of expectations and that also took its toll. In the US, data began looking better, with existing home sales beating expectations. 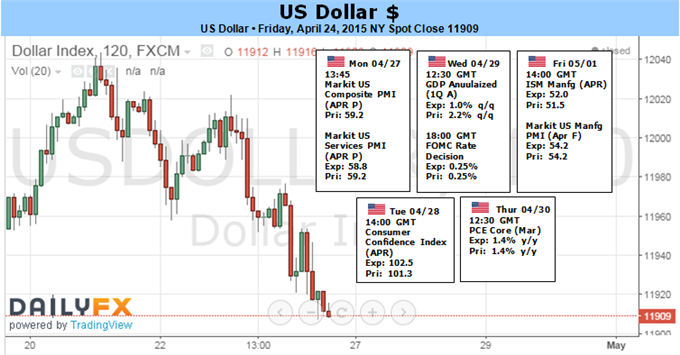 But it’s far from looking rosy and as the week advanced, the dollar was hit by weak data. All in all, it’s a mixed picture with quite a lot of action. German CPI: Wednesday, state data released during the morning with the all-German read coming at 12:00. The largest economy in the euro-zone saw prices rising by 0.5% in March, a second consecutive beat of expectations. A drop of 0.1% is expected in the early release for April. ECB monetary data: Wednesday, 8:00. The European Central Bank has made a lot of efforts to pump money, and this is bearing fruit. The annual rise in the M3 Money Supply stands at 4%, after long months of a very slow rise in the amount of money in circulation. 4.3% is predicted now Private loans are still contracting on a y/y basis, at 0.1% in February. The figures for March are expected to show an improvement, especially on the background of QE implementation with an annual rise of 0.2%. French Consumer Spending: Thursday, 6:45. The zone’s second largest economy has enjoyed 4 consecutive months of growing spending by consumers, but the figure for February fell short of predictions by rising only +0.1%. A drop of 0.5% is on the cards now. Spanish Flash GDP: Thursday, 7:00. As one of the first countries that releases in GDP data, this will be closely watched. The country enjoyed a strong growth rate of 0.7% q/q in the last quarter of 2014. According to government officials, growth could even be stronger now: 0.8%. Spanish Flash CPI: Thursday, 7:00. Growth is partially built on a fall in prices. The zone’s fourth largest economy suffered from one of the worst levels of deflation, but this seems to be waning off. For March, a fall of 0.7% was seen in CPI. The same annual drop in prices is expected in the preliminary number for April. German Unemployment Change: Thursday, 7:55. Germany enjoyed many months of drops in the number of unemployed. In February, Germany saw a drop of 15K and the unemployment rate stood on 6.5%. Another similar drop is on the cards: -14K. ECB Economic Bulletin: Thursday, 8:00. The data in this report is what the governing council of the central bank sees before making its monetary decisions. In the April rate decision, no policy change was announced and Draghi shrugged off talk about QE tapering despite the economic improvement. This could give some more insight into the current conditions. Inflation data: Thursday, 9:00. The euro-zone remained in deflation in March, with a drop of 0.1% in prices, but this was better than expected. Core inflation stood on 0.6% and showed that the underlying weakness – it is not only oil prices. Headline CPI carries expectations for a flat 0% while core CPI is expected to stand at 0.6% once again. Unemployment Rate: Friday, Thursday, 9:00. After a few signs of falls in unemployment, the situation isn’t too good. At 11.3%, the old continent has a long way to go. A small drop is on the cards now for March, to 11.2%. The euro scaled a three-weak peak against the dollar on Monday, on optimism about Greece’s prospects after the government reshuffled its bailout negotiating team as the cash-strapped country seeks to avoid a default. Greece looks set to run out of funds in the coming weeks. On Monday, Greek Prime Minister Alexis Tsipras appointed Deputy Foreign Minister Euclid Tsakalotos, an economist well liked by officials representing creditors, as coordinator of the bailout negotiating team, giving him a more active role in the debt talks. The change would sideline Finance Minister Yanis Varoufakis, who had been very active in the Greek negotiating team. The Varoufakis-led team came out empty-handed from Friday’s meeting of the Eurogroup finance ministers in Riga. The EURUSD had a bit of up and down time of it as the NY session got underway, but the support level held (see earlier post) against the 1.0915-25 area. 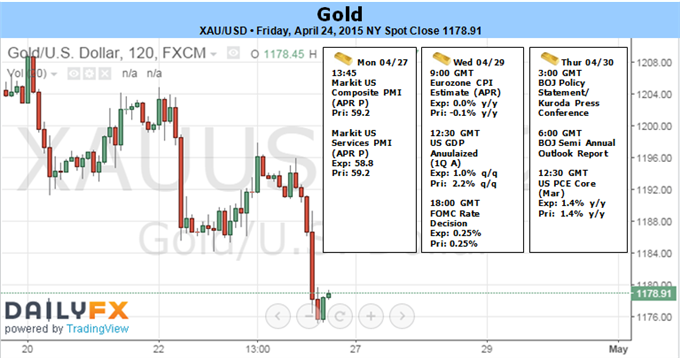 The subsequent rally has seen the price extend above the 1.0971 level (highest close since March 5th). 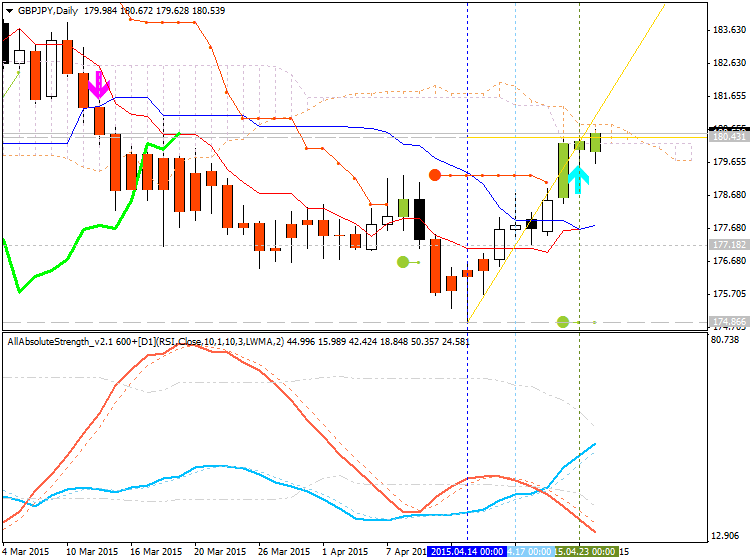 The next target is up at the 1.1000 level and there is some early profit taking against the level (or so it seems). The natural resistance level has been breached 6 separate times over the last month and a half - each failed. The high has extended to 1.09887 so far. Real close support comes in at 1.0971. If it stays above that level, we should see a serious test of the 1.1000 level. The range for the day (was 91 pips earlier) is now at 130 pips. The average trading range over the last 22 days is 131 pips. So we have reached the average. 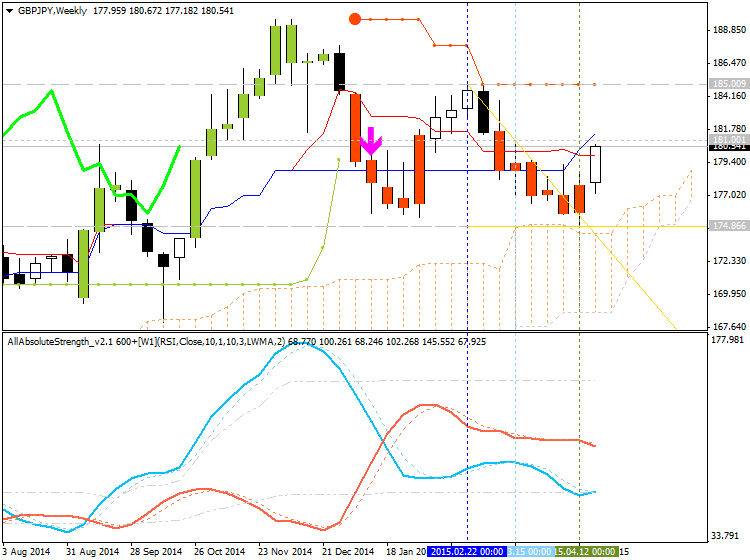 That does not stop the market from going higher but it can make additional moves more difficult. Traders who are long, can take partial profit against the 1.1000 level. If we do get a break, however, there will likely be stops as the squeeze continues. The next target would be at 1.1025-35 area where highs from April 3 and April 9th stalled (and March 24th as well - see chart below). The high on March 25 peaked at 1.1051.